For Day 3 of Blogging Marathon, i invite you all for a Festive Lunch. 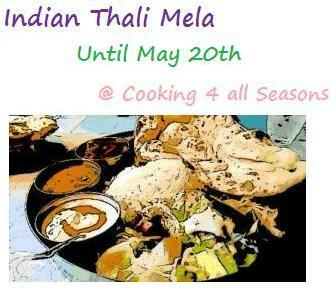 The Thali Featured is made for Tamil New Year's Day. I Love Cooking for festivals for the Variety we have. Never mind slogging in the kitchen for the whole day, but ultimately when we sit together and relish each and every dish all the tiredness evaporates!!!!! My Friends used to ask me, why do you want to make so much when there is only 2 +1 of you to eat. I simply say, staying outside my country and i dont want my kiddo to grow up without knowing our traditions, i want him experience each and every festival and the way it will be celebrated back home,i dont want him to blink and say i never knew that they do so much on such a day. Though there is lot of variety, i cook the minimum of all,most of it will get over after lunch and rest is packed for dinner. Mango Pachadi. Avaraikkai/Broad Beans Curry, Sweet Potato Fry, Mint-Coriander Lentil Vada, Vendaikai Thayir Pachadi/Okra Raita, Applam, Capsicum Sambhar, Carrot Kootu, Paruppu Rasam, Yellow Pumpkin Kheer. Manga Pachadi/Mango Sweet Pachadi, the heroine of the day. This is a must on a Tamil New Year's Day menu. It Symbolizes the essence of life.The recipe contains Sweet - Jaggery, Sour - Raw Mango, Bitter- Neem Flower/Veppan poo and Spicy - Red chili. Life is a mixture of everything sweet, sour, bitter and spicy so be ready to face another year with all these mixed together by tasting this All-in-one pachadi. Yellow Pumpkin is used in most of the festivals as it is considered auspicious. Normally we make sambhar using this, but this time i tried making kheer and it was a instant hit, Hubby dear asked me whether it is Badam Kheer!!! Recipe Coming next week. Capsicum Sambhar, Carrot Kootu and Paruppu Rasam. Staple Dishes in everyday south-indian cooking. Coriander-Mint Flavored Lentil Vada. It is a tradition to make Paruppu/Lentil vada on Festive days. Since the Lentils resemble auspiciousness. Instead of trying the same old paruppu vada, i added a handful of coriander and mint leaves to give an extra zing to the vada. Perfect Combo for a Vadai is Thayir Pachadi/Raita. Here this Flavorful vada is served with Okra Raita/Vendaikkai Thayir pachadi. Saute till chana dal turns brown. Add Sliced Avaraikkai/Broad beans and saute.Add 1/4 Cup of water, cover and cook in a low flame till done. When the beans are 3/4th done, add grated coconut and moong dal and mix well and Cook unitl done. Serve warm as a Rice accompaniment. wonderful display..pumpkin kheer I want to try! It is commendable that you take so much trouble to ensure that your child keeps in touch with his roots. Delicious meal.. I like the green and yellow colour of the banana leaf..looks very decorative. Very nice Priya...love the color of yellow pumpkin payasam. Nice spread. Priya... eating meals in the elai is so perfect. Nice spread Priya. I totally agree that our kids must not miss out on the traditions just bcos we are out of India. Lovely dishes! what a festive spread, looks really authentic. Super delicious spread, definitely our kids dont miss our traditions and foods eventhough we rnt in India, just love eating in banana leaf..
Super spread priya.. I really miss home.. We made all of these but to eat in plate.. :( very nice. Pumpkin Kheer waiting for recipe! Even we make make mango sweet chutney for ugadi but the texture is little different. Priya - amazing festive spread.. appadiye puthandukku vandhra maadri aachu... lovely combo of vegetables ! What a lovely spread!..everything looks so good.. The best meal ,i luv to have during festivals.. Awesome spread Priya, love the glossy look of mango pachadi. My favourite spread.